Setting up infrastructure from Zero to Cloud in One Hour With the Google Cloud by Robert Aboukhalil. Geogriana Gligor writes on Smart, Scalable Content Distribution. Learn how and why we must of safety first when writing code in The Train Wreck: When Safety Is Discretionary by Ed Barnard . In our regular columns, Matthew Setter takes the Period library for working with date and time ranges for a spin. Community Corner shares how to really support a project. Joe Ferguson writes about handling HTML forms and HTTP requests with Laravel. 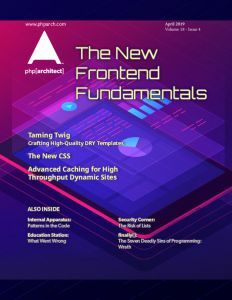 Chris Tankersley debuts his new column The Dev Lead Trenches. Eli White opens up about his personal story about mental health.